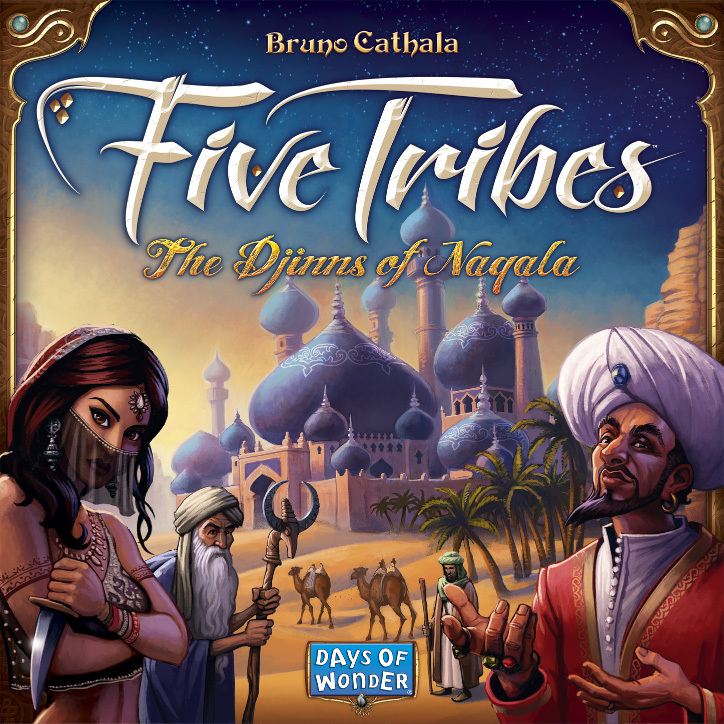 In the land of the Arabian Nights, oracles foretold of strangers who would maneuver the Five Tribes of Viziers, Elders, Builders, Merchants and Assassins to gain influence over the legendary city-state Naqala in their bid to become Sultan. Some will even call on the powerful Djinn for help. 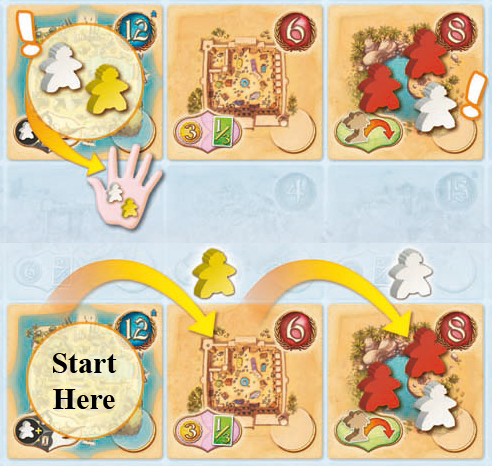 In Five Tribes, your goal is to become the new Sultan by acquiring the most influence, represented by victory points. The old one conveniently died recently. 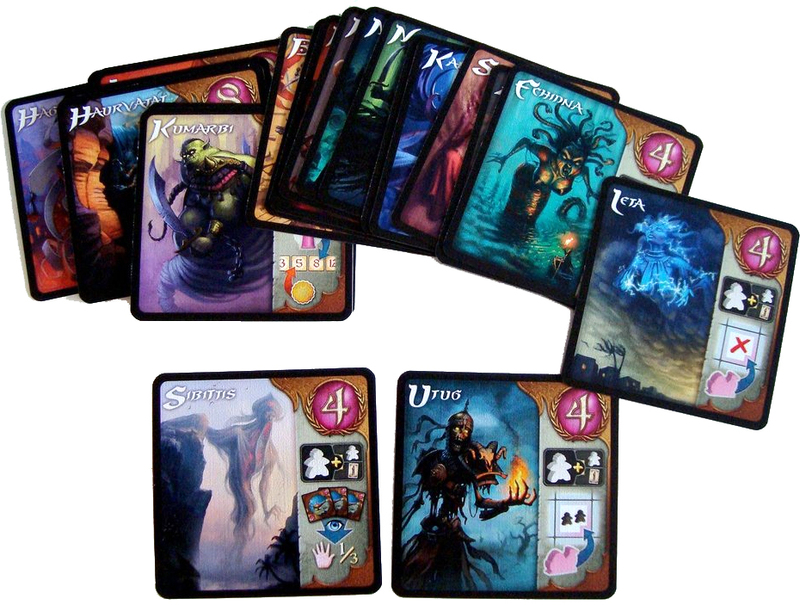 Tiles, coin, goods, Vizier, Elders and Djinn all provide victory points. Leveraging the Tribe and tile actions efficiently is the key to success. You’ll also need to grease a few palms if you want get a jump on the competition. Players begin each round with a bid for turn order. The initial order of bidding is determined randomly. In turn, players pay zero to 18 coins to place their markers on the Turn Order track, after which play commences accordingly. Five Tribes is very mancala-like. 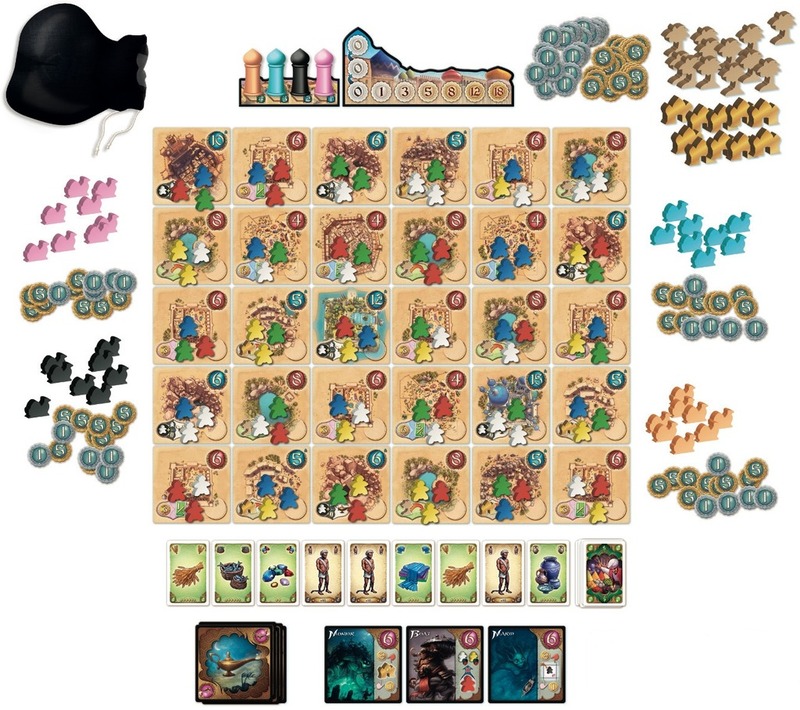 On your turn, you pick up all the meeples on one tile, which represent members of the five tribes, and drop them tile by tile, like breadcrumbs, on a path to another tile. The last meeple you drop must match a meeple on the final tile. Then you pick up all of the tribe members matching the meeple you just dropped and perform that Tribe’s Action. Viziers (yellow) and Elders (white) earn you victory points at game end. Elders can alternatively acquire and invoke Djinns. Builders (blue) earn you coin. Merchants (green) acquire goods. Assassins (red) kill one meeple. If when picking up all tribe members, you clear an unclaimed tile completely, you can claim it as your own by placing one of your camels there. 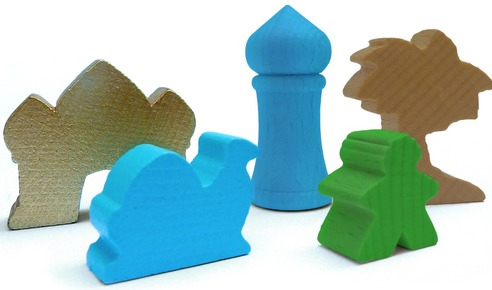 If a meeple assassination clears an unclaimed tile, you can also claim that tile for your own with a camel. After invoking the Tribe’s Action, you can now perform the Tile’s Action (the one your last meeple landed on). If it’s an Oasis, place a palm tree on it; a Village, build a Palace there. Palm trees and Palaces increase the value of the tile. If it’s a Market, you may pay coin to acquire goods: 1 good for 3 coins at a Small Market or 2 goods for 6 coins at a Large Market. If it’s a Sacred Place, you may expend two Elders or an Elder and a Slave to acquire a Djinn. Djinns not only grant victory points at game end, they also have special powers you can invoke once per turn, sometimes at a cost. After performing the Tribe Action and the sometimes optional Tile Action, you may now sell goods if you desire to acquire some palm-greasing funds. You’ll always be able to sell your goods at game end, so the only reason to sell them sooner is to acquire money for turn-order bidding. After each player has taken her turn, players again bid for turn order then play in that order. Play continues until the end of the round in which a player placed his last camel or there are no mancala-like moves left. Then you add up: your coins, the values of the tiles and Djinn you control, points for Elders and Viziers, your Vizier bonus if any, and your accumulated goods. The player with the most victory points is named Sultan of Naqalla! Five Tribes supports 2 to 4 players ages 13 and up and plays in 40 to 80 minutes. Five Tribes is a medium-light strategy game. While the player turns are pretty simple: 1) mancala some meeples, 2) perform their tribal action, 3) take the tile’s action and 4) sell goods if desired; making the most effective use of the those actions is another story. 1001 stories! Multiple plays will likely reveal deeper strategies. Here Be Books & Games has a house copy so they can teach you how to play! Copyright © 2015 by Tina G. McDuffie. All rights reserved. Photos courtesy of Days of Wonder.